Bespoke Chocolate Pizzas - A Unique Gift For Every Occasion! 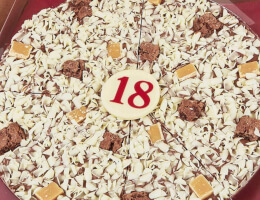 If you’re looking for a bespoke gift, why not take a look at our personalised chocolate pizza range. Chocolate is always a welcome gift; everyone loves a sweet treat and it’s versatile so you can send it to people of any age, gender, for any occasion, and regardless of how well you know them. It’s a simple gift that lets people know you’re thinking about them. If you want to make your chocolate gift that little more special, you might want to take a look at our bespoke chocolate gifts. You can create custom messages, personalised to the recipient and design unique pizzas based on their personal tastes. Our personalised pizzas come in a range of mouth-watering tastes. You can choose your flavour, size and add a message based on the occasion and guest. Write their name, wish them happy birthday or even display their age, whatever you choose we’ll help you to create a special gift unique to them. For those of you who want total control over your chocolate pizza gift, select the Design Your Own pizza option. Our bespoke design pizzas come in three different sizes to suit all budgets. You choose what type of chocolate you want for the base – milk, white or dark. 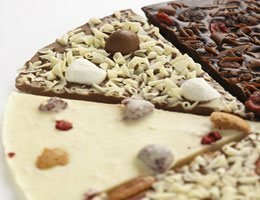 We only use the smoothest Belgian chocolate for our pizzas so you can rest assured whichever flavour, your pizza will taste delicious. You can then choose the flavoured chocolate curls that top your base. Our pizzas are rich in chocolate, we add several layers to ensure you get more for your money. On top of the curls you can choose up to three different toppings. With delights like toffee, honeycomb, marshmallow, berries, fudge, hazelnuts, brownies and jelly beans (and much more) to choose from you can be as creative as you like. Once you’ve chosen your perfect pizza we’ll do the rest. We’ll create you a chocolate masterpiece and slice it into pieces, in case you didn’t want to eat it all in one. Just remember to design their pizza based on your loved one’s favourite sweets rather than your own. You can’t get more of a bespoke chocolate gift than our Design Your Own pizza.